Isn't this something we say and hear so often? Bored - Our definition to being bored is to not having anything exciting to do or rather not having ANYTHING to do. It's so easy how we just announce our boredom to ourselves and to the people around. I find myself in this situation pretty often and just go with the flow, meaning just continue getting bored. Little i do is, to take away that boredom and think of why is it that i'm actually getting bored. Yesterday, i was at a talk at a college here in NY. This was something which i usually don't see myself doing. Not that i can't, but it's just that i never thought of doing it earlier. The entire trip from how i decided to attend the talk to the moment i got back home after the talk, was exciting. I was happy. I thought to myself - 'Why didn't i do this earlier?' In fact, i was even thanking the cousin who invited me to the event and asked her to invite me more to such talks, because i felt so good being a part of it and i definitely wanted to have more of it. While we were getting back home, i came across something which i bet, was meant just for me. This ad was put up inside the train in which we were travelling. I was standing opposite to it and when i read it, i was like "WOW, That's actually so true"! 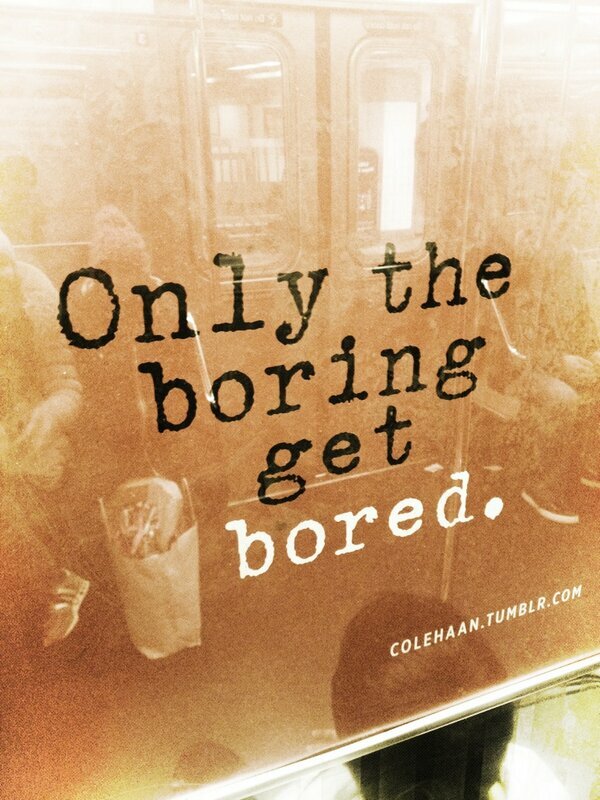 Funny how we just say 'I'm bored' but don't reflect on the 'Why' part of it. There is sooooooooooooooooooo much (infinite 'O's could be added in there) to do, IF WE WANT TO. But no, we choose to be bored instead. Isn't that the easiest way out? Being bored is easy, to take away that boredom requires effort. And that's something a boring person would least care about. It's because you aren't doing anything. But I don't have anything to do! ANYTHING!!! Congratulations! You are being conferred with the... 'Boring' title. It's upon us what we choose to do and how we choose to be. There is such a wide world outside our homes and inside as well, courtesy, the internet. Yet, we choose not to explore both. Let's go out, explore our neighborhood, explore our city. Every walk we take down that street, would be something new. We would see new people, learn new things. We wouldn't even realize that we are learning, but trust me, we do. There are so many events going on around us, let's strive to be a part of it, let's make an effort to engage in the community, the society that we are in in our own small ways. Talking to someone, even giving a smile, gives us a kind of happiness, at least for me it does. Being on Facebook, Twitter, Instagram etc and refreshing feeds over and over again is not a way to take away boredom. In fact, i feel that's boring! Let's try using our time well. Internet has so much good to offer if we want to take it up. That hobby, that interest of ours, let's take a shot at it. We sure have a long way to go, but let's take that first step towards it. Seek knowledge about the Almighty, take up a course, DIY projects, write blogs, make videos (useful ones i mean), help someone, volunteer for good causes, meet friends and family, celebrate small achievements, smile, give a lot, share ideas, visit the library, READ, explore nature etc etc etc. In short, start getting better in any small way you can think of. Saying this is easy, the difficult part is to execute it. But won't it be for our good? A little effort, a slight push is all it takes to get started. I got bored, i'm writing this post! ;) See, easy-peasie! :D Ain't it? You can do something else, something that you are good at and there is DEFINITELY at least one thing that you are good at. I bet my life on that! If there is nothing, that's even better! You can take up anything under the sun and start getting better at it! Coolio! So the next time before you say 'I'm bored', think twice! You don't wanna be labelled as 'boring'! Do you? Wallah, this is so inspiring. Especially loved that para about the things to do....wow. I can't believe I haven't come across this before. I need to read all your posts! Jazakallahu khaira Haffi :) I really hope to inspire myself and others through this post insha'Allah ! :) glad you liked it! i thought id drop by your blog and read your posts and im glad i have stumbled upon this one as the first one. For a long while i was 'bored' of doing the same thing over and over again. im a big internet user and can surf it for hours at length but there is times when you dont want to be near a pc and something else is sought to pass time in a positive manner. So in recent weeks i put myself to a little test, i have to learn to read arabic and write it. i speak arabic pretty well and get around talking with my local friends so the back up is the reading and writing, of course it would benefit me too as id be able to read Quran instead of transliteraions. i think once we step out of our little bored comfort zone and actually set up a task and achieve it then we realise what other great oppertunities there are out there. Dont know why it took me so long to realise this but ahh its all good now. time for me to read some more posts on your blog while having a cup of chi. have a blessed and happy day. hugs to your baby boy. Maasha'Allah it's so good to know that you are using your time so fruitfully. It's one if the best ways to utilize your time. I have always been a person whol looooves learning languages. Thanks to that, I can converse in quite a few languages, alhumdulillah!